Log supply Killearn and within 30km radius. Log supply and tree surgery Stirlingshire, Central Scotland. Ewan Bain, a local contractor with a sound reputation, can deliver a full service from professional tree surgery to the supply of seasoned hardwood logs, delivered directly to your door. Competitive prices. Quick and clean jobs. Professional service. Whether supplying private domestic clients, or restaurants, pubs and hotels, you can expect the same high level of personal service and attention. Dealing with a diseased tree, an overgrown Leylandii or a tree obscuring your view, Strathendrick Logs offer a professional and competitively priced local service. Strathendrick Logs also provides a full service for landscaping, excavation, garden maintenance and a high pressure jetting service to clean driveways etc. If you have something in mind, don’t hesitate to ask, and Strathendrick Logs will discuss your requirements. We are a local Stirlingshire couple that offer a friendly, professional and affordable solution to picking-up and moving items, both for individuals and businesses. Nothing is too much trouble, and we will happily move one item, do multiple runs or cover a full house move. Based in Buchlyvie, Stirlingshire, we cover the whole of mainland UK. Removals available within Scotland, England & Wales. We have mechanically sound vehicles with clean interiors, and will handle your items with care and diligence. The vans are cleaned inside after every single job when possible, and we always check to make sure nothing has been left behind. We do not carry rubbish, building debris or garden waste, so you can be sure that our interiors are dry, clean and fresh. We are happy to give a free, no obligation estimate for any job. We like small local jobs. We also like challenging jobs that take us somewhere new. The Shire Man & Van Hire covers all of the UK and operates on an hourly basis, so whatever job you have us do, you can be sure that the price is fair and consistent for all of our customers. There are no additional charges for distance, as this is covered within your timed job, and distance is no obstacle. Our time starts from the second we start the van up as this is when we are at work. The only small additional fees are for stairs and they vary depending upon how high you live plus extremely heavy or bulky items. We have now introduced a loyalty scheme for repeat customers whereby I can offer some 10% discount for those who come back time and again. In the case of motorcycle breakdown, we are insured to take up to 2 passengers to their chosen destination (with their bike) at no additional cost. We do not charge for cancellations when at least 24 hours notice is given, however there will be a cancellation charge of 50% of the job if cancellation is received less than 24 hours prior to the job. This charge is to keep things fair, and reflects the removal jobs we will have missed by taking the booking. We do not operate runs to/from the tip or dump or carry any kind of rubble/’dirty’ materials. If you have a household item that is clean and dry, and you are having removed from within the house, we can take this to the tip. We want to give our customers 5* service, and a dirty and smelly van is not good for business. Fantastic, reliable and trust worthy pair. Billy and Jen have done so many jobs for me. From moving house to delivering small packages. Always very accommodating to your needs and have never let me down. Can not fault them in anyway as you will discover when you use them. Amazing service. My first ever big move after being in my flat for 18 years (man I have a lot of stuff) and they made it stress free. Turned up on time and didn’t complain once about the bazillion steps. They moved me from my top floor flat in Glasgow to a storage unit and then to Aberfoyle and although my stairs have broken others carrying less, they remained cheery throughout. Really friendly and a great service. Would fully recommend and hope to use again. Billy did a house move from Thornhill to Dunecht for us. Great price and super efficient. We reserve the right to increase costs where items have been added, or were undisclosed at the time of booking. All offers are in the form of an estimate and subject to change. Friendly and approachable, please get in touch with us for an informal chat to see what we can do for you. Chris is one of only a handful of qualified tree inspectors in Scotland. 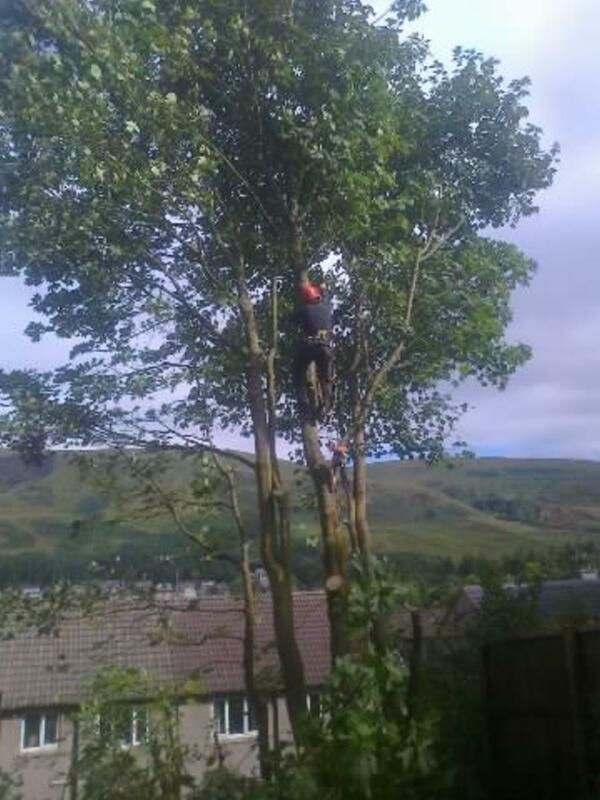 Chris carries out tree inspections across Scotland. While your local Tree Surgeon is likely to be a highly skilled tree worker, few are qualified inspectors, and it is vital to know you are legally covered when it comes to trees on your property. Professional and friendly, Chris is well known in his field of work and advises home owners public bodies, country estates, Protected Areas, developers, property managers and insurance companies. Every home owner should be aware that they have a responsibility when it comes to the trees on their own land. Tree owners are responsible for trees on their land and have a legal duty of care. It might be a tree is next to a footpath or road, or is at the boundary of another property, and can pose a potential risk to the public or another property. A tree inspection for £150 can save you many times that amount in the long run, and unecessary tree removal will cost in the region of £500. Existing tree owners should have inspections carried out if no inspection has been carried out as soon as possible. With mature trees, an inspection every three years is recommended. Prospective homeowners should have the trees on a property inspected before purchasing a new home as a tree problem could be expensive to solve or have damaged the building in some way. Sometimes banks and mortgage companies require home buyers to get a survey before purchase. A tree inspection is particularly important if mature trees are in the grounds or near the buildings. Never undertake tree work yourself or allow an amateur to do it because you think it will save you money. Tree work is potentially highly dangerous, requiring skilled craftsmen often high above ground level using special equipment. This equipement can only be used legally by a certificated and competent person. Do not leave yourself open to risk, avoid injury to yourself, other people, damage to your property, and legal action – household insurance will not protect you. With over twenty years of working with land owners and the private sector The Tree Inspector offers a range of value for money services tailored to landowners needs. A comprehensive tree management service enables owners to ensure they are able to meet their duty of care in relation to trees and public safety; balanced appropriately with other land management operations. The Tree Inspector provides arboriculture consultancy services for development sites throughout the lifecycle of a project from pre-purchase and pre-design of a site through to design, planning application and construction phases. Expertise results in timeous solutions; resolving potential conflicts between planning, design and construction to ensure a successful planning application and construction. We liaise with all stakeholders during this process and in particular the local Tree Officers to discuss design proposals including arboriculture advice during the design stages. Arboricultural Implication Study (AIS) on proposed development as part of a planning application. Protected Areas and sensitive areas for biodiversity. Protected areas involves managing trees safely for public access together with enhancing biodiversity, requiring almost opposing management prescriptions. The Tree Inspector can advise on the appropriate application and location in each case. Chris Calvey has twenty six years experience in the conservation sector and was the Senior Manager for The Loch Lomond & Trossachs National Park. Public safety and the conservation of trees in the community are high priorities and professional tree risk assessments enable local authorities to reduce the risk of damage or injury caused by trees in their care. We provide a full range of arboricultural consultancy services for local authority and government sites. The Tree Inspector offers a comprehensive range of services to any individual or organisation that has trees growing on their land. Chris is happy to chat to anyone who is unsure whether a survey might be a good idea in their particular situation, and can advise and guide on a wide range of tree-related issues. Please get in touch for a friendly and professional service.